Marvel Comics "I Am an Avenger #5" Numbered Limited Edition Giclee on Canvas by Alan Davis; Includes Certificate of Authenticity. 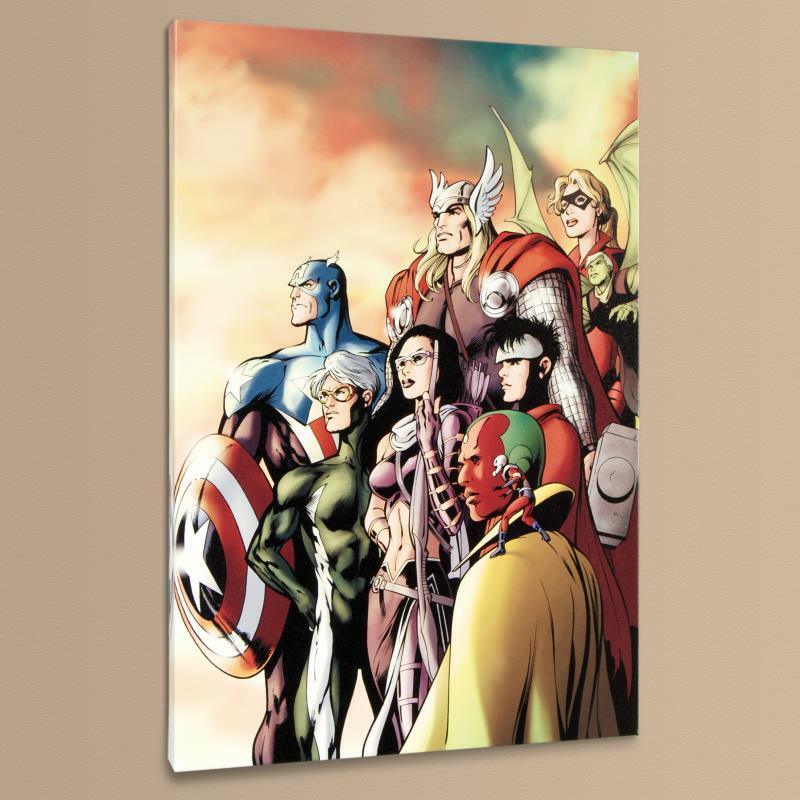 A piece of comic book history, this limited edition, from original art by Alan Davis, depicts Ant-Man,Vision, Hawkeye, Wiccan, Speed, Captain America, Thor, Hulkiling, and Stature. An English artist, Alan Davis, began his career in comics on an English magazine, his first professional work was a strip called The Crusader. His big break was drawing the revamped Captain Britain story in The Mighty World Of Marvel. In 1985 Davis was hired by DC Comics to draw their Batman and the Outsiders title, and in 1987 he moved to Marvel Comics in the US, where he worked on titles such as The Uncanny X-Men and eventually launched the comic Excalibur. 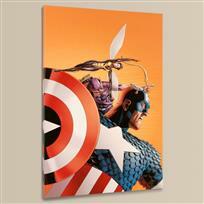 "I Am an Avenger #5" is a limited edition numbered giclee on stretched canvas by Alan Davis presented by Marvel Comics. This piece comes gallery wrapped. Includes Certificate of Authenticity! Measures approx. 18" x 27" (image); 1.5" (depth). Shipping and Handling: $34.95 FREE SHIPPING! First known as Timely Publications in 1939, then Atlas Comics in the 1950s, the comic book empire known as Marvel Comics came into being in 1961 with the launch of the first Fantastic Four. With the help of creative geniuses Stan Lee and Jack Kirby, Marvel produced 831 comic books, each with at least one new superhero, during the 1960s. Known for focusing on characterization and placing heroes in a real-world context, Marvel’s popularity with comic book readers continued to rise through the decades. Soon, Marvel was sporting a veritable pantheon of pop culture icons, including Spider-Man, Iron Man, the X-Men, the Hulk, the Fantastic Four, and Captain America. Marvel eventually added films to its entertainment arsenal, and has been behind some of the top-grossing films of all time including The Avengers and the Iron-Man, Thor, and Captain America franchises. 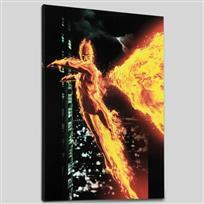 Marvel Comics "Ultimate X-Men #2" Numbered Limited Edition Giclee on Canvas by Kaare Andrews; Includes Certificate of Authenticity. 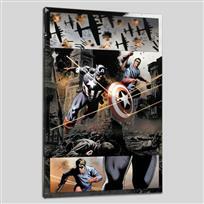 Marvel Comics "Captain America #37" Numbered Limited Edition Giclee on Canvas by Steve Epting; Includes Certificate of Authenticity. 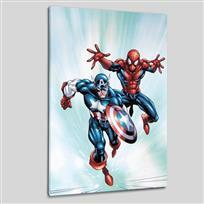 Marvel Comics "Marvel Age Team Up #2" Numbered Limited Edition Giclee on Canvas by Randy Green; Includes Certificate of Authenticity. 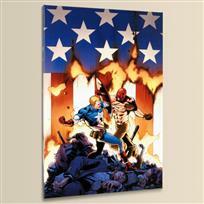 Marvel Comics "New Avengers #1" Numbered Limited Edition Giclee on Canvas by David Finch; Includes Certificate of Authenticity. 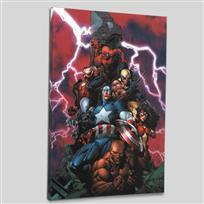 Marvel Comics "Ultimate Avengers #8" Numbered Limited Edition Giclee on Canvas by Carlos Pacheco; Includes Certificate of Authenticity. 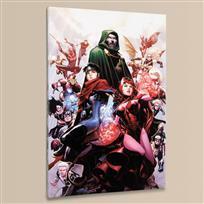 Marvel Comics "Avengers: The Children's Crusade #6" Numbered Limited Edition Giclee on Canvas by Jim Cheung; Includes Certificate of Authenticity. 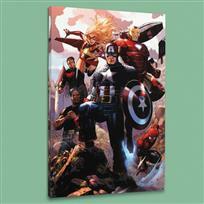 Marvel Comics "Avengers #77" Numbered Limited Edition Giclee on Canvas by John Cassaday; Includes Certificate of Authenticity. 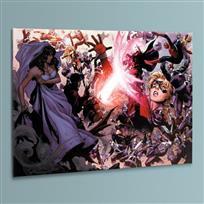 Marvel Comics "Avengers: The Children's Crusade #4" Numbered Limited Edition Giclee on Canvas by Jim Cheung; Includes Certificate of Authenticity.